Hurren, Elizabeth T. 2016. 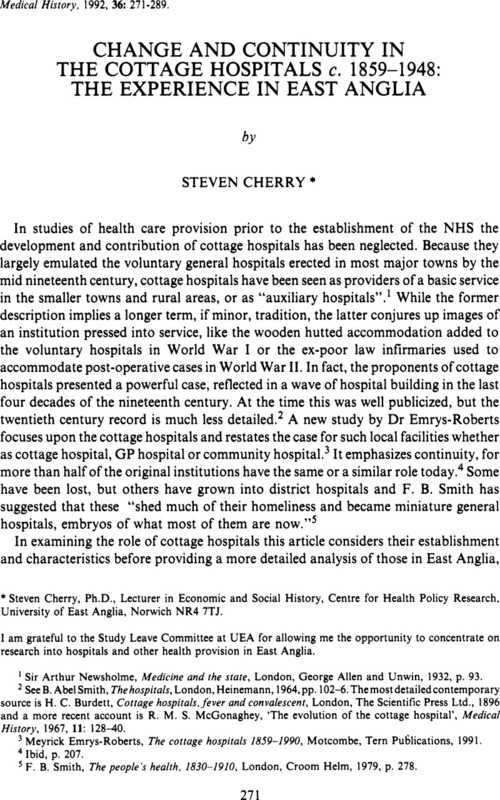 “Deliver Me From This Indignity!”: Cottage Hospitals, Localism and NHS Healthcare in Central England, 1948-1978. Family & Community History, Vol. 19, Issue. 2, p. 129. Gorsky, M. and Mohan, J. 2011. Uses of Yearbooks: The Voluntary Hospitals Database. Social History of Medicine, Vol. 24, Issue. 2, p. 478. Gorsky, Martin Mohan, John and Powell, Martin 1999. British voluntary hospitals, 1871–1938: the geography of provision and utilization. Journal of Historical Geography, Vol. 25, Issue. 4, p. 463. * Centre for Health Policy Research, University of East Anglia, Norwich.